The Results of the All India Law Entrance Test (AILET) 2017 have been declared by National Law University (NLU) Delhi on May 24. The exam has been topped by a female law aspirant, Dhanistha Mukesh Mittal, who also achieved the rare distinction of being the only candidate to score 100 marks this year. It must be noted that AILET offers admissions to BA LLB (Hons. ), LLM and PhD programmes at NLU Delhi and the results declared on May 24 are only for the undergraduate law programme. Candidates will be able to check the category wise results and the merit list for AILET 2017 through the links given on this page. Conducted on May 7, AILET 2017 saw as many as 17,054 applicants applying for admissions to the 83 seats (10 for foreign nationals) offered in the Five Year Integrated BA LLB (Hons.) programme, as per AILET 2017 Convener, Dr. GS Bajpai. The exam was held in an offline mode and the question paper was set out of a total of 150 marks, with candidates being awarded one mark for each right answer. There was no negative marking. While AILET has developed a reputation for being one of the country’s tougher law entrance exams, Careers360 had reported on the exam day about how candidates found this year’s paper to be considerably tougher than those of preceding years. This is also reflected in the scores achieved by the candidates. While last year’s topper, Karan Dhalla scored 119 marks, only one candidate was able to attain the three figure mark this year and also subsequently topped the exam. Earlier, the declaration of AILET 2017 Result had been postponed by NLU Delhi from May 17 to May 24. Candidates can find below further details about AILET 2017 Result including how to check, the AILET 2017 Cut Offs and the list of AILET 2017 toppers. Candidates should click on the official link of AILET 2017 given below. They can download the given pdfs for AILET 2017 results as per their choice of category. To check for all candidates, they may download the AILET 2017 Roll Number wise pdf. The candidate can see their qualifying position in the given merit list of candidates who cleared AILET 2017. Apart from the AILET 2017 Merit List which displays only the names of the Indian nationals who have qualified for the 73 available seats across all categories, NLU Delhi has also released separate result list as per category and place of origin, all of which can be checked at the link given below. To check the Results of the All India Law Entrance Test 2017, candidates can Click Here. 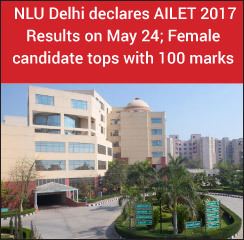 NLU Delhi has also released the cut off data for AILET 2017 which shows the scores that candidates would have to clear category-wise in the AILET 2017 Result in order to be eligible for admissions. The AILET 2017 Cut Off scores can be seen by candidates in the table below. The top ten scorers in AILET 2017 in the General Category as reflected in the AILET 2017 Merit List can be seen by candidates in the table below. As notified by NLU Delhi, out of the 73 seats available in the BA LLB (Hons.) programmes, 52 will be for General Category candidates, 11 will be for Scheduled Caste (SC) candidates, 5 for Scheduled Tribe (ST) candidates and 2 for Persons with Disabilities (PwD). There will also be 3 seats for candidates who are either Kashmiri Migrants or Residents of Jammu and Kashmir. In addition to the 73 seats, 10 more seats will be made available for Foreign Nationals. The University has begin to dispatch individual admission letters which the qualified candidates will need to confirm and use to pay their fees within the specified last date. AILET 2017 LLM and PhD Results will be declared on July 1 and July 15 respectively. Read the latest news and articles on AILET at law.careers360.com!